Toss your Sharpies! Milwaukee has a great set of products with the InkZall markers, and they work well on even the harshest environments and surfaces. Milwaukee Tool demonstrated something really cool at their 2013 Press Event (which they call their tool symposium). It was their new Inkzall Jobsite Markers. While we took a look at them shortly after the event, we decided to revisit the markers and see how they are holding up today. The Milwaukee InkZall markers are a brand new type of writing tool that takes the characteristics and capabilities of a “Sharpie” and amps it up significantly. Primarily, what’s most impressive is that they’re designed and optimized particularly for job site use. That means they have clog-resistant tips. The name Inkzall is in keeping with their uncanny ability to write through dusty, wet or oily surfaces. The Milwaukee InkZall markers can strike a line through 1/2-inch of sawdust or even thinset or drywall dust. Using the marker, I wondered how on earth the technology was even possible. As it turns out, the ink is the secret as well as how the tip is made—specifically in its ability to retain its usefulness over rough surfaces that would tear a tradition felt tip to shreds. The new Inkzall line includes both Fine and Medium point tips for their permanent markers and a stylus/marker combination tool that is built for use with iPads or other tablets—eve with gloved hands. Milwaukee recently even introduced three new colors of InkZall, so you can now make your mark in Black, Red, Green, or Blue. I bet your Sharpie can’t do this! When the Milwaukee InkZall markers debuted back in 2013, they were only available in fine point and stylus packs—and all in black. Now, you can buy the Milwaukee InkZall markers in chisel point, and in any of four colors. The InkZall markers are also available as single markers, 2- and 4-packs, or even 36-packs for those who want to stock up. The ink in these Milwaukee InkZall markers is a proprietary design that allows for faster drying times to reduce smearing. It also resists drying out quickly when the cap is left off. One feature we really liked was the built-in hard hat clip which makes for easy storage and access on the job site. All Milwaukee Inkzall markers were designed from the ground up, so referring to them as “Sharpies” was something that garnered looks of disdain from the folks at Milwaukee—they are most definitely not simply rebranded permanent markers as our testing revealed. We started our testing with simple wood marking on plywood sheets. These markers seemed to excel at the basics, and the availability of both fine and medium tip, as well as chisel tip, meant that we had a lot of options to choose from depending upon the level of accuracy and precision we needed. 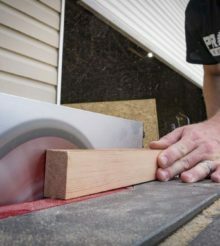 On plywood and dimensional lumber, we felt the medium tip did best, delivering a great way to make marks that were accurate to 1/16th inch and easily readable. Fine tip may be a problem on rough sheet goods, but it worked well on 2x lumber due to the smoother surface. Taking the marker to a much more difficult application—concrete—let us really give it a nice workout. We also didn’t wait for the concrete to dry completely before using an InkZall chisel marker. On wet concrete, the marks were easily discernible, though not as nearly sharp and clean as with dry concrete. This is a great new marker for those looking to spend less time marking and remarking areas where the first try should be good enough. The Milwaukee InkZall markers are a noted improvement on traditional permanent markers with one exception. They do tend to wear down a bit faster due to the composition of the tips. This may be a factor of ow they are designed to hold the special formulate ink, or how they do a better job of not drying out even when the lid is left off for an extended period of time. In any case, the pricing of these markers is such that having more on-hand outweighs the potential issue of premature tip failure. I can highly recommend these markers for any tradesmen who has experienced the downsides of traditional pens and marking instruments on more difficult materials. I’m a masonry contractor and I recently started using these instead of pencils, and I gotta say they seem to work well. They’re so much better than sharpening a pencil every 5 min, and the lines don’t blow off when I cut with a concrete saw. The tips do wear down rather fast when pressing down on a rough surface, but take some pressure off and they’ll last for quite s while.